In July of any year, one of the nicest places to visit is the southern coast of Oregon. U.S. Highway 101 is the primary access route, north and south. Additionally, several highways cut east and west, winding along the river valleys and upper canyons, providing a change of scenery from the coastal strip. Driving north from California across the Oregon border brings a couple of shocking revelations. When you arrive in Brookings, which is the first town you will encounter, you will notice that motor gas prices are about twenty cents cheaper per gallon than in California. The lack of a retail sales tax and lower state fuel taxes makes Oregon a great place to fill your tank. Well, maybe not so great, once you realize that Oregon does not allow self-service filling of one’s own fuel tank. The supposed “positive result” of this archaic law is that it keeps thousands of Oregonians employed as gas station attendants. The downside is that during the summer tourist season, motorists queue up at the lower-priced stations, engines idling and pollution spewing from their tailpipes as they wait. Despite the many “Keep Oregon Green” signs that one sees along the highway, old energy and old-style thinking are adding an immense load of greenhouse gases to the Oregon air shed. If estimates are true that the average vehicle produces about one pound of carbon dioxide for each mile driven, how many additional tons of carbon dioxide do Oregon motorists produce in order to make dead-end jobs for some of their residents? Additionally, how many hours of lost productivity do Oregonians suffer as frustrated motorists wait in line for fuel that they could safely pump without assistance? Once you get past the pros and cons of Oregon’s fuel pricing and dispensing methods, you can breathe a sigh of relief as you motor north towards Gold Beach, some twenty-five miles beyond the California border. If you have breakfast or lunch in Gold Beach, you will notice that the pace of life is a bit slower than California. If you allow yourself to slow down and match the natural pace in Southern Oregon, you will enjoy your experience far more than if you simply rush towards your destination. In the early days of travel along the Oregon Coast, towns sprang up along the highway approximately every twenty-five miles. The ostensible reason for this spacing related to how far a horse-drawn vehicle could travel in one day. With that idea in mind, twenty-five miles north of Gold Beach is the sleepy town of Port Orford, famous in its heyday for the “Port Orford Cedar” trees that covered its coastal slopes. Although hidden from the highway in many places, the coastal strip between Gold Beach and Port Orford has several direct openings to the sand and surf. Owing to the gentle slope of the continental shelf in this area, low tides pull far out from the beach and high tides rush in on large breaking waves. Flotsam from Asia and driftwood from the Pacific Coast are among the prizes awaiting the intrepid beachcomber. 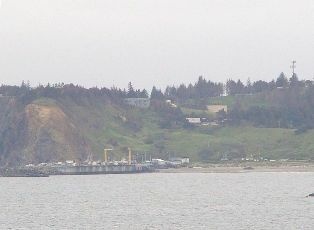 Although the commercial port at Port Orford is so small that they haul out the fishing fleet with dockside cranes, it is the only deep-water port along the coast between Portland, Oregon and the San Francisco Bay. Protected by headlands to the north and west, the small port remains vulnerable to storms approaching from the southwest. As with several other Southern Oregon coastal towns, much of Port Orford lies within the “tsunami zone”. Once erroneously called “tidal waves”, Americans have adopted the Japanese word “tsunami”, which means, “One or a series of huge sea waves caused by earthquakes or other large-scale disturbances of the ocean floor”. Nearby Crescent City and Eureka, California has each experienced tsunamis in the past fifty years. Many places along the Oregon coast show geological evidence of large-scale tsunami activity, although contemporary coastal dwellers tend to downplay or ignore the potential threat. At Port Orford, one has to travel nearly a mile inland to find ground high enough for the state to declare it a “tsunami safety zone”. Whether it is for reasons of tsunami safety or lack of sewage plant capacity, Port Orford qualifies as the only town along the highway where recent commercial development is almost unknown. Although there is a new library adjacent to the highway, there are no chain restaurants in town. The pharmacy closed its doors a few years ago, leaving only a clinic to tend to the healthcare needs of the many retired residents. The infrastructure is so antiquated and poorly documented that the local water system was recently losing between one third and one-half of its stored water to leaks in the system. Many leaks are nearly impossible to track down and fix in the wetlands and other marshy areas around the town. Founded in 1851, Port Orford is the oldest town along the coast. Its population of less than 1500 is not much different than it was in the late 1800s. In its heyday, Port Orford featured a sawmill that efficiently transformed the old-growth Port Orford Cedars into planking for sailing vessels and later for insect and mildew resistant cedar-shake shingles. Both the sawmill and the old-growth cedars are gone now, leaving retirement living and tourism as the top two economic engines for the town. Unlike coastal areas farther north, the Southern Oregon coast rarely experiences frost, although the area can be windy and rainy in the fall, winter and spring. During the summer months, the weather can be clear and beautiful. It can also be overcast and gloomy, but rarely is the area hot, when judged by standards of the inland Western U.S. Viewing the area from the air for the first time can be quite a shock. What looks like untouched forests, when viewed from ground level, looks like a logger’s paradise from the air. 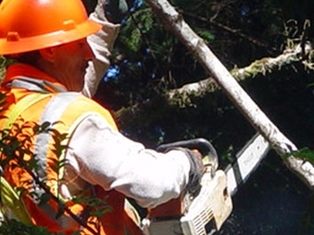 Often loggers leave only a fringe of untouched forest along the highway. Forest products are an essential industry in Oregon, but every time I see a load of scraggly and twisted old-growth tree trunks barreling down the highway towards the chip mill, I cringe. With its many coastal state parks, Oregon makes amends for its questionable logging practices. To its credit, forward thinking Oregonians, such as the 1960s Governor Tom McCall helped pass legislation setting aside most of Oregon’s 363-mile coastline as parkland or open space. No other coastal state can boast such forward thinking in its use of irreplaceable coastal environments. Additionally, there are many public campgrounds and private RV parks tucked into the shady groves along Highway 101. If you have an RV and have the time, a trip north or south along Oregon’s Highway 101 is well worth your time. Just don’t let your engine idle while you wait in line for fuel.